Reader’s Digest has unveiled a new look and some new columnists for its May edition. Editor Gill Hudson is seeking to stem sales losses which ran at 22.7 per cent year on year in the second half of 2010 to 338,850 copies a month. Reader’s Digest was bought out of administration in a £13m management buyout backed by private Equity Firm Better Capital in April. New columnists include Martha Lane Fox on technology, Donal MacIntyre on consumer issues and short-lived Top Gear editor Conor McNicholas on motoring. The key bit of marketing speak from the press release: “infotainment for grown-ups”. Under award-winning editor Gill Hudson–already shortlisted for the 2011 PPA editor of the year award for her work on Reader’s Digest–Britain’s fourth-biggest monthly title has undergone a major revamp, including a ‘clean, contemporary and classy’redesign, a £500,000 investment in dramatically improved paper stock, new regular features, and a clutch of high-profile new columnists. · World-renowned co-founder of lastminute.com and now the UK ‘s digital champion, Martha Lane Fox joins as technology columnist. · Donal MacIntyre, one of Britain ‘s best-known television presenters and investigative journalists, tackles consumer issues. · Conor McNicholas, former editor of NME and BBC Top Gear magazine, heads up a motoring column. Other new columnists include comedian and regular TV panellist Natalie Haynes, gadgets expert Olly Mann, sports broadcaster Andy Zaltzman, and Radio 2 food and drink expert Nigel Barden. The raft of new writers takes the count of well-known columnists to over 20. They include: James Brown, ex-Loaded editor; Stuart Maconie, BBC Radio 2 and 6 Music presenter; Michelin- starred chef Marco Pierre White; award-winning health writer Susannah Hickling; Martin Hughes-Games from BBC2’s Springwatch and Autumnwatch, and Bob Flowerdew, from Gardeners’ Question Time. A four-stage in-depth qualitative and quantitative study by Reader’s Digest, in conjunction with insight company Cousins Davis, has shed new light on today’s 45-60-year-olds. Defying previous stereotypes, a new generation of switched-on and self-improving over-45s–the magazine’s target demographic–is emerging. They are media-savvy, often with children still at home, and driven by the desire for knowledge and self-improvement. 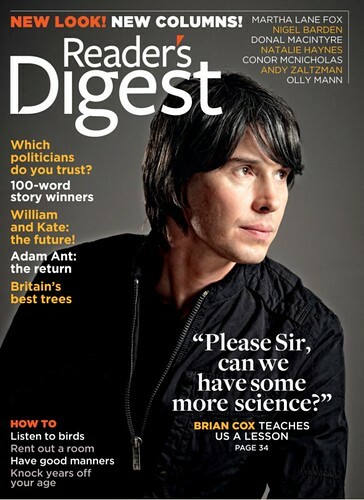 The design and content of the May issue, featuring pop-star-turned-physicist Professor Brian Cox on the cover, brings together this insight from the research, with a strong emphasis on infotainment for grown-ups: accessible, useful, and fascinating facts. With a refreshed image and investment in brighter and whiter paper, the magazine’s makeover is a milestone in the brand’s ongoing development. Gill Hudson, editor-in-chief, adds: ‘It’s fantastic to have had so much support and investment in the magazine–from outside the company as well as from within. The fact that so many top writers have been so willing to join us says everything about the affection and esteem in which our magazine is held, and is a strong vote of confidence in the brand. These are all people with tremendous knowledge of, and credibility in, their respective fields. Our readers love to learn, so it’s hard to imagine a better or broader mix of brains for them to be exposed to.